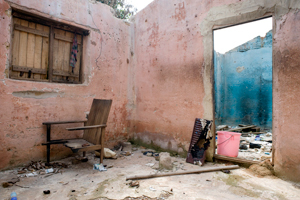 In order to encourage refugees and internally displaced persons to return to their home, damaged houses such as this one should be rehabilitated. “Gbagbo’s soldiers came. It was nighttime, they shot and killed people. I ran away with my two children. My husband disappeared.” This is how Patricia, a 23-year-old mother from the Man region in western Côte d’Ivoire, described her ghastly experience to members of a Caritas mission last June. Patricia, who was five months pregnant at the time, walked through the forest for a whole week before being taken in by a woman. Then once again soldiers attacked the village and she fled to Liberia. But nothing was organised there to welcome her and other villagers. In the end, the people displaced from this village went home and are now sharing their scant resources, which are quickly running out. “I’m afraid to go back home,” says Jacques, who fled his village of Benouin in April. According to him, pro-Ouattara militias are responsible for the devastation of his village this time. Jacques is sure of this. Members of a Caritas Internationalis mission managed by Caritas Côte d’Ivoire have heard many similar eyewitness accounts. On 3 October 2011, the International Criminal Court (ICC) authorised its prosecutor to investigate crimes against humanity and war crimes alleged to have been committed in Côte d’Ivoire by the forces of former President Laurent Gbagbo and President Alassane Ouattara. “This initiative is a step in the right direction according to Jean Djoman, the national coordinator of humanitarian operations Caritas Côte d’Ivoire. In addition to the ICC’s actions, the Ivorian government has also set up a National Commission of Inquiry into the post-electoral events. This authority will investigate and deal with cases of serious violations of human rights. He added that Caritas will also support initiatives already underway, as well as those initiated by churches and local communities. For example, in the west of the country, near the border with Liberia, the association of village heads is carrying out actions to raise awareness and bring communities closer together. Caritas could help them by facilitating transport for village heads and providing conflict-resolution training. On 11 December, Ivorian citizens will be called upon to vote again in general elections. Will the country have gone far enough down the road towards peace and reconciliation to allow the elections to take place without lapsing into violence? It’s a question that everyone involved should be asking themselves today.